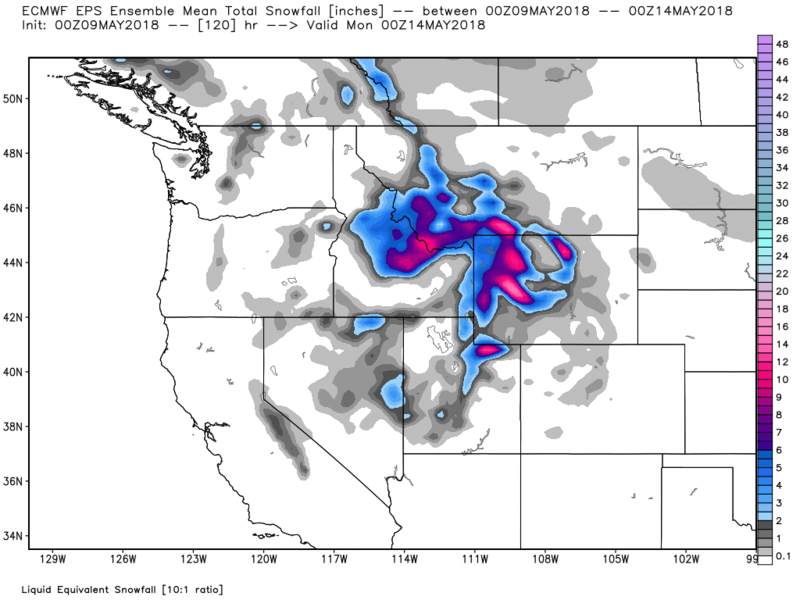 Earlier forecasts showed a good chance for powder this weekend (May 12-13), but updated forecasts now keep the storm well to our west with little snow here in Colorado. When storms become cut-off from the main west-to-east flow of weather, they often move more slowly and further south than the models initially predict. That is exactly what’s happening with the upcoming storm. Instead of the system moving east into Colorado, it will stall to our west and maybe jog further south as well. Even though we know that the weather forecast models are biased and don’t accurately forecast how slow and south cut-off storms will track, it’s still hard to disbelieve the early model data that did show the system moving into Colorado. Below is the snow forecast through Sunday, May 13th from an average of 51 versions of the European model. Not much happening here in Colorado, but lots of potential to our west! The storm might finally push east into Colorado early next week (May 14-16), and we could see some snow at that time, though amounts likely won’t be super deep. Since the upcoming storm is fizzling for us, this is actually going to be my final post for the 2017-2018 season (I’ve said that three times in the last few weeks:-). I’ll plan to post again later in the summer with an update on our new website and app, and a look ahead to the next season.